The newly expanded Price Center now boasts a grocery store, lounges, computer labs, a ballroom and offices. But more is to come. Here is a tentative schedule of when other components of the expansion will open. The Loft @ UCSD and restaurants, including Burger King, Santorini Island Grill, Tapioca Express, Bombay Coast. Students, staff members and faculty packed the Price Center’s new atrium, leaning over balconies and crowding staircases. Many held plates piled with food. Other listened to the many DJs and bands scattered throughout the building. 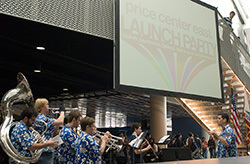 In all, about 4,000 members of the UC San Diego community turned out Thursday for a launch party that celebrated the expansion of the Price Center. The project, known as Price Center East, doubles the size of the facility. It adds lounge spaces, offices for student organizations, a ballroom and a full-service grocery store to campus. By fall, new restaurants and a nightclub also will open. “This promises to be the best student center in the United States and it’s for you, the students,” said Chancellor Marye Anne Fox. The building stands at the heart of the campus’ downtown neighborhood, which is now starting to take shape, Fox said. “This project is bringing a new level of energy to campus,” she added. It is also, and above all, a home for students, she said. Vice Chancellor Penny Rue echoed Fox’s comments. “It’s like your living room, your family room,” she said. She added she was particularly excited that the new building will provide offices for the campus’ more than 450 student organizations. Associated Students President Donna Bean quipped she was looking forward to another feature. ”I’m most excited about Yogurt World.” she said, referring to a vendor that will offer a wide variety of frozen yogurts and toppings. UCSD's pep band performed during the party. The excitement took hold with Vice Chancellor Steven Relyea, too. “Is this cool, or what?” he asked at Thursday’s event. “This is just truly amazing.” The new Price Center East also is an exciting project because it will be easy on the environment, Relyea said. It is about the same size as the old Price Center, but uses only about half as much energy and emits about half as much carbon dioxide. 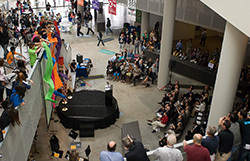 The building also received the third-highest rating, known as silver, under the Leadership in Energy and Environmental Design Building Rating System for its environmentally-friendly features. Matthew Bright, the chair of the University Centers Advisory Board, encouraged fellow students to explore the building’s four floors. And explore they did. Many spent quite a bit of time in the new ballroom, where they stood in line to get free food samples from some of the eight new restaurants set to open in fall in the Price Center East. So far, vendors include Santorini Island Grill, which will serve Mediterranean food, Burger King, Tapioca Express, an Asian tea shop, and Bombay Coast, an Indian restaurant. Food also is available at the Sunshine Market, a full-service grocery store located right off the atrium that is already doing brisk business. 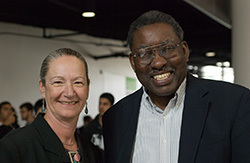 Vice Chancellor of Student Affairs Penny Rue and Ex-Vice Chancellor of Student Affairs Joe Watson. Seniors William Gaieck and Hanqing Pan enjoyed wraps and Chinese food outdoors, on a small plaza, where a band was playing. Gaieck said he liked the Price Center East’s new indoor food court. It seats about 350 people. He also said he liked that students now have much more room to study. “It’s really neat to have a hub on campus,” he said. Staff members Katie Harris and Maria Ramirez, who work in student health services, said they believed students will feel more connected to campus. “I think they will feel more at home at UCSD,” Ramirez said. But perhaps the most anticipated part of the Price Center East is The Loft @ UCSD, a night club, restaurant and performance lounge set to open in September. Organizers plan a weeklong festival for the occasion. Performances for an audience of 150 to 175 will include everything from rock 'n' roll, to hip-hop, to spoken word, to film festivals. On some nights, the space might be open until 2 or 3 a.m., or even later. 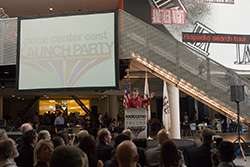 Price Center East filled up with attendees during the Expansion Launch Party May 12. Other parts of the Price Center East will be open around the clock, including a computer lounge with 32 machines. In all, the building offers 10,000 square feet of lounge space on several floors. Tammy Han, also a senior, was already using some of the computers in the atrium to check e-mail. “I think it’s a really good idea,” she said of the expansion. A 4,500-foot, two-story ballroom with a built-in stage and a high-tech lights and sound system will be completely up and running by June 1, as will a dance studio, which can be used for rehearsals. The Cross-Cultural Center also is set to move to the Price Center East that month. The Grand Stairs, a series of tall concrete steps that will double as seating space, will be ready by mid-June. A Triton statue is set to go up in front of the stairs at a later date. The expansion has been in the works since 2003, when students approved a referendum to increase fees and build additional facilities. Construction started in spring 2006. A committee, which included many students, helped determine which services would be available in the new structure. Thursday, A.S. President Bean looked on as her fellow students crowded the building and learned more about its features.